There are about a zillion possible ways you could use this free printable crochet chart. I designed it for crocheting, but it could be adapted for other crafts too. 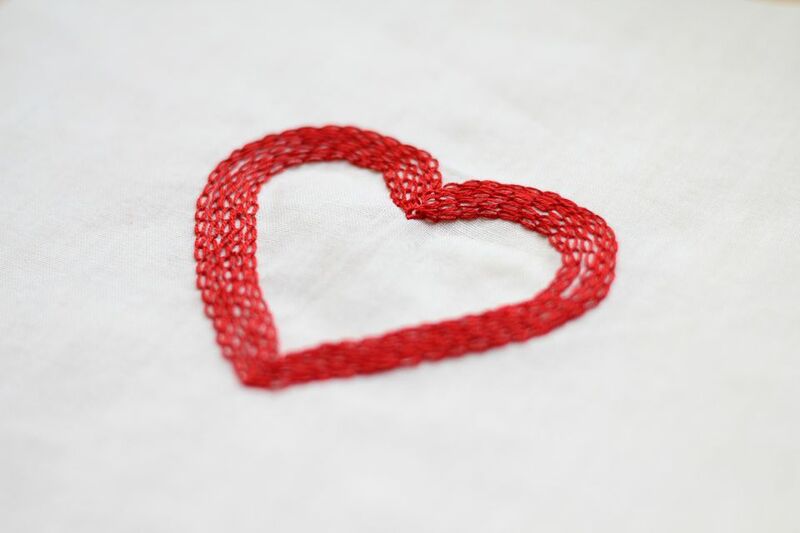 Crochet a one-color heart-shaped motif using the chart plus this free pattern. You'll also want to take a look at this modified version of the chart, and this one. Note that there are many possible ways you could approach the crochet work here. I've suggested one way of doing it, but there are quite a few other ways that would work. If you'd rather work the pattern sideways, or upside down, or from the bottom up, you could do so. The results would vary. Please feel free to experiment if you are so inclined. Crochet a two-color square using the white squares on the chart as one color, and the red squares on the chart as the other color. 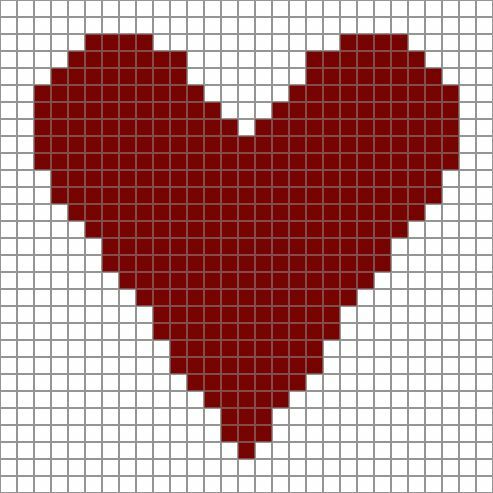 Crochet a background of Tunisian simple stitch or single crochet stitch, and use the chart to cross stitch this heart design onto the crocheted background. You could also use this chart for filet crochet. Note to Knitters: This chart isn't intended for knitting. Knit stitches aren't square, so if you knit the chart as-is, your heart would turn out looking "squished." To remedy that, you'd need to remember to repeat every third row in the chart (or possibly every fourth row, depending on your gauge - it's not an exact science). For that matter, crochet stitches aren't always perfectly square either. In this case, they are close enough that the chart works fine. If you compare my crocheted heart against the chart, you'll see that there is a bit of a difference. You may wish to decorate this heart with crocheted flowers. faux flowers, lace or other fun embellishments. This picture gallery has plenty of embellishment ideas you can use. Crocheted Heart Motif. Photo © 2010 Amy Solovay, Licensed to About.com, Inc. I spent some time messing around with the heart chart - printing it out, cutting it up, folding it in different ways, and turning it upside down - with the goal of figuring out the best way to crochet the heart motif. I tried it several different ways, and the photo above shows the result I liked best out of all my experiments. I've uploaded a free pattern with specific instructions for crocheting this heart motif exactly as shown so that you have written instructions in addition to the charted design. After you've crocheted your heart, you may want to embellish it with crocheted flowers, faux flowers, lace or other pretty baubles. This photo gallery has plenty of embellishment ideas you can use. Chart for Crocheting the Top of the Heart Motif. Photo © 2010 Amy Solovay, Licensed to About.com, Inc. This chart makes it easier to work from the bottom up. The lower row on this chart is row one. The row directly above it is row two, and so on. After you've crocheted a row, compare it with the row above it on the chart. If there are fewer stitches on the row above, you'll need to decrease. If there are the same amount of stitches, you don't need to decrease. Starting with row 3, I found it easiest to split the heart in halves and only work half at a time. After you've completed this chart, you're going to flip your crocheted piece upside-down and start working the next chart. Or, if you'd prefer, you can work from the free heart motif pattern, which includes written instructions for the crochet work. Upside Down Heart Chart. Photo © 2010 Amy Solovay, Licensed to About.com, Inc. This version of the heart chart is upside-down, with rows 1-8 marked - they are the rows inside the pink rectangle area. Before working this chart, you should have already crocheted rows 1-8. Then at that point you flip your work upside down and begin working row 9 on this chart. You'll work row 9 into the foundation chain of the crocheted piece. Why do it this crazy way? Well, I found it easier to crochet the heart motif starting with the widest point of the heart. I made that row 1, even though it wouldn't have logically been row one on the original heart chart. Then I worked from the bottom up. If you do it this way, after crocheting from row 1 to the top , you still need to work the rest of the heart. So that's why you flip it upside down and start working in the other direction. Please see the free pattern with written instructions for more details. Crocheted Square With Heart Motif. Photo © 2010 Amy Solovay, Licensed to About.com, Inc. This crocheted square was created using the free printable chart for a heart motif. The square was worked in two different colors of Cascade 220 wool yarn. They made the heart motif appear to stand out more. They helped to visually smooth out the heart's jagged edges. They helped to hide some messy spots where I was a bit sloppy with my color changes. When working from the chart, you have to plan ahead for your color changes. If you are working in color A and you want the next stitch to be color B, you can't just work the next stitch in color B. You have to work as far as the last step in color A, then drop color A and work the last step of the current stitch in color B.